Fun, friends, and adventure, every afternoon. The Afternoon Program is for children from TK/kindergarten to third, fourth, or fifth grade, depending on the grades that the school offers. (In San Carlos, Arundel and Heather go through fourth grade, while White Oaks and Brittan Acres go through third, and in Belmont, Central goes through fifth grade.) After their school day, children walk over to an After School classroom for an afternoon of fun, play, adventure, and a variety of other activities for them to choose from. 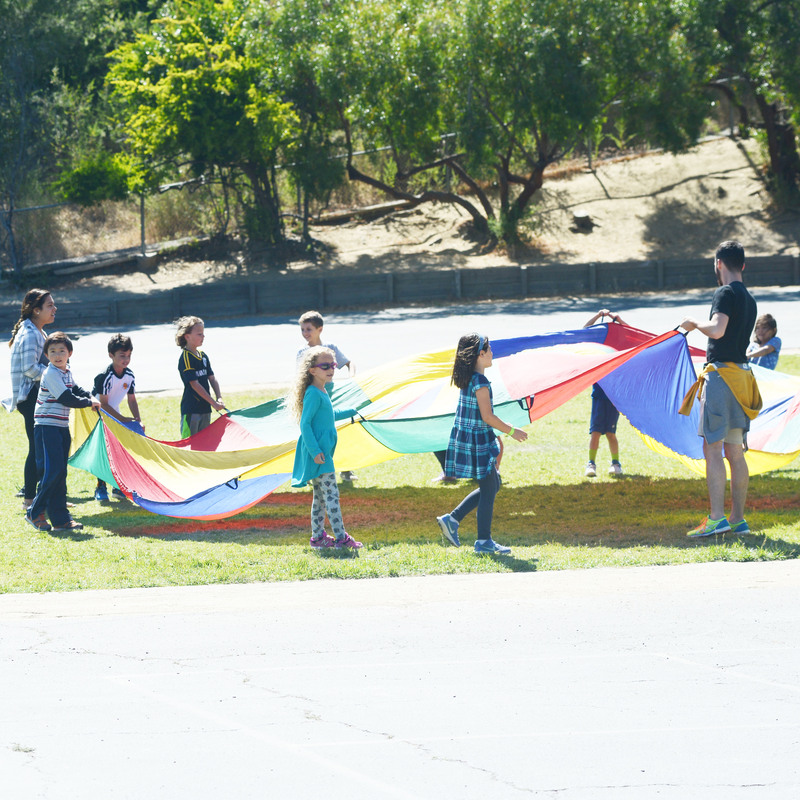 We believe that children, like adults, want the freedom to choose their own activities after a long day of structure within the classroom—this freedom to choose is what makes our Afternoon Program loved by parents and kids alike. Typically, children are enrolled in our Afternoon Program from TK or kindergarten until the time they move on to middle school. The Afternoon Program begins when your child gets out of school and walks over to the After School classroom on each campus. TK and kindergarten children are escorted from their classrooms by our staff, and older children walk over in groups on their own. Our Afternoon Program provides some structure, like engaging group activities, but also gives children options for how they want to spend their afternoon. Activity options include making arts and crafts, baking a yummy treat, playing outdoors with their friends, spending time talking to one of our staff, doing their homework, or spending quiet time alone reading a book. Your child makes the choices, and we support them every step of the way. One thing never fails: kids are always hungry after school. To meet this need, we provide a healthy afternoon snack each day that always includes fresh fruit or vegetables. Snack menus are posted monthly at each of the After School classroom sites. In addition, we are always willing to work with any parent of a child who has a specific concern or food allergy. Due to the large number of children with peanut allergies, we maintain a separate “Peanut Free” table and do not serve peanut butter or any item that we know has peanuts in it. We know getting homework done each day is a priority for many parents. To address this priority, the Afternoon Program provides a Homework Club, available to any child whose parents indicate they would like them to participate. After snack time each day, the Homework Club meets in a group together at quiet tables to do their homework. Homework Club is managed by one of our staff members, who are there to support children’s homework needs, and make sure that children finish the majority of their homework when possible. Homework Club runs for approximately 1 hour; children are free to leave the area and join in on the other activities as soon as their homework is completed. At several of our schools, private contractors provide on-site enrichment classes, ranging from Spanish to tennis. If you would like to have your child attend an enrichment program offered on campus, please register through the school district and then let your Site Manager know which outside classes your child is taking. After School staff will drop off and pick up your child from each enrichment class. Years of experience have taught us that the better we know each child, the better we can serve them and their families. Therefore, we limit enrollment to five days per week with no drop-ins or short-term participants. By being regularly involved in the lives of the children we serve, we can provide them with the stability of an adult who knows them well and understands their world. We encourage all of our families to share as much with us as they feel comfortable, so that we can be supportive in the process of raising their child. Each child is unique. We make a point of celebrating important milestones in a child’s life such as birthdays or a lost tooth. We also recognize good sportsmanship and outstanding behavior each week with special awards. Each site maintains a Super Store of goodies that children can “purchase” on a monthly basis with stamps they have earned through contests, positive behavior, games, and other activities. In addition, we love being part of a community that represents many parts of the world. When possible, we like to infuse different cultures into our activities–from “Grandma Latke” coming in and teaching kids to make tasty treats and making handmade tortillas on Cinco de Mayo, to our very own Gung Hay Fat Choy celebration. To give our parents and families an opportunity to have a night out, we host special events called Friday Fun Nite about four or five times per year. Friday Fun Nite begins when After School closes at 6 PM and ends at 10 PM, and are often scheduled close to holidays. Friday Fun Nite is filled with special activities such as pajama parties, pizza, and art activities. The night is usually concluded with a movie, popcorn, and orange slices. Friday Fun Nite is an optional activity, and is limited in size and open to current enrollees and siblings only. We have found that Friday Fun Nites are extremely popular with both parents and kids; for any questions about Friday Fun Nite, or to sign up, talk to one of your After School Site Managers. We encourage you to make an appointment to visit one of our classrooms if you are considering enrolling your child in the Afternoon Program. Since enrollment is limited due to space and licensing requirements, we generally maintain a waiting list at each location. Please note, this list is only for children in first through fifth grade. Click here if your child is entering TK or kindergarten.